The GICHD's Manual Demining Study included comparative trails of different manual demining tools and equipment. 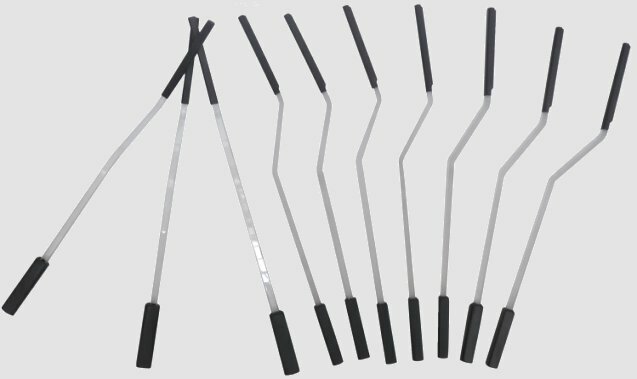 These trials established conclusively that the use of simple, powerful magnets increase the speed of metal detector clearance dramatically wherever there is metal "clutter" in the working area. The picture shows a typical collection of scrap-metal from a minefield. The only non-magnetic bit is the ring pull from a drink-can. Security Devices offer a magnet-clip (SKU3027) that attaches to any sharp-edged tool. It is easily moved from side to side for right or left handed use. There are powerful magnets on both sides of the clip so that the back of the tool can be passed over the ground (without touching) to attract any surface fragments. If that fails to find the fragments, the spoil is tipped over the magnets as excavation is carried out and ferrous items adhere to the magnets. Security Devices have also made a magnetic Brush-rake. 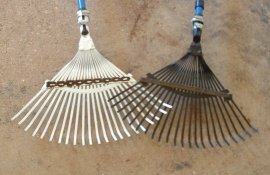 The Brush-rake is increasingly used to clear leaf-litter or mulchings from the area in front of the deminer. With powerful magnets attached towards the rear of the rake-head, the fragments loosened during the brushing are collected as the rake is used. During the GICHD tests, the magnet Brush-rakes were so useful that they made clearing in heavily fragmented area with a metal-detector just as quick as clearing where there were very few fragments. Contact us for more information. Our simplest magnetic tool now uses a strip of 8mm polycarbonate with neodymium magnets attached (SKU3028). This is brushed lightly over the ground to attract fragments. Order number: SKU3028, Magnet stick. WARNING: Magnets must not be used in areas where devices with fuses that may be subject to magnetic influence may be found. For information about the use of specialist rakes in demining, see Section 6 in this Chapter of the online Generic Demining SOPs.